Torch down roofing (sometimes referred to as “torch on” roofing) is so named because it requires an open-flame propane torch. 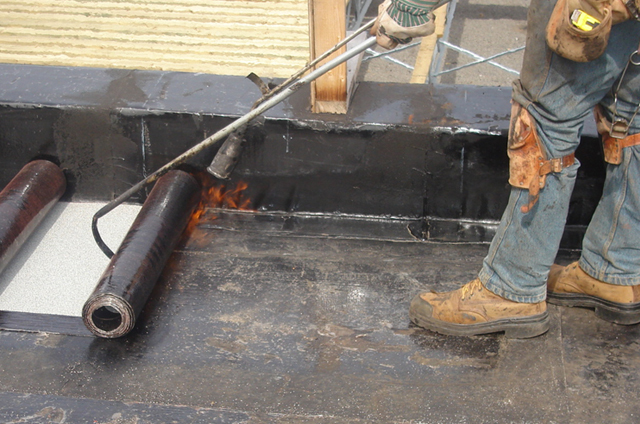 In this installation method, sheets of modified bitumen are rolled out onto the roof, and a roofing professional uses a hand-held propane torch to heat the material and adhere it to the surface. Once the layers reach the right temperature, seams are melted together to create a waterproof seal. The membrane layers of a torch down roof are made of an asphalt compound called bitumen that is modified with either rubber or plastic. The main strength of this type of roofing is that it can expand and contract without melting or cracking. It has a high tolerance for both the heat and the cold it will experience on the roof during the change of seasons. There are different types of torch down roofing including two-layer and three-layer systems. If you’re wondering whether torch down roofing is the right choice for your flat roof, you can learn about the pros and cons of torch down roofing from this article. We’ll also cover the details of the materials and layers that are used to create a torch down roof. You may have heard a reference to a torch down roof as a “rubberoid” roof (implying the material contains rubber), but that may not be accurate. All torch down roofing is made from modified bitumen, or bitumen with additives. Bitumen is made from asphalt, a tough material that is used in many roofing applications. 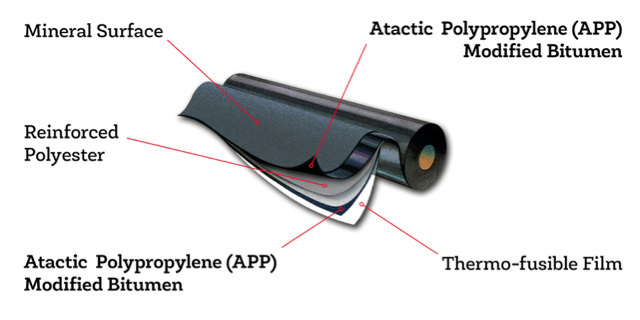 Manufacturing torch down roofing requires modifying or mixing the bitumen with a polymer. The first polymer used for this purpose is Atactic Polypropylene (APP), which is a form of plastic, not rubber. APP torch down roofing membranes are flexible and respond well to both heating and cooling. Another polymer added to create modified bitumen roofing material is Styrene Butadiene Styrene (SBS) modified bitumen. As a form of rubber, SBS also makes the bitumen flexible and has a lower melting point than APP. SBS modified bitumen roofing membranes can be installed by torch application, but are also self-adhered, cold-processed, or applied with a mop. A mat of fiberglass, polyester, or other material is often used as a sturdy core for torch down roofing membranes. Manufacturers also may embed small granules into the top of the membrane to add fire resistance, color options, ultraviolet (UV) radiation protection, or other distinctive characteristics. There are two main types of torch down roll roofing: two-layer systems and three-layer systems. Both systems have a base and cap sheet, but in the three-layer system, the roofing professional will apply a base sheet, then a smooth cap sheet, and finish with a granule cap sheet. This extra layer helps extend the life of the roof and usually enhances fire resistance, energy efficiency, color, or other features. Insulation: Especially in cold climates, a flat or low-slope roof needs insulation to retain heat in the building/structure. The insulation is applied first and is either mechanically attached with screws and plates or fully adhered with glue or a hot mop, depending on the deck type and performance level required by the designer. Vapor barrier: Next is the vapor barrier. This underlayment helps prevent the roof from developing condensation or moisture issues. Overlay board: The roofing professional will lay down an overlay board or cover board next, to support the torch down roofing membrane. Care must be taken to apply the overlay board correctly to prevent “ponding,” which is when the roof is not level and collects water. Base sheet: This is the first layer of modified bitumen membrane. The base sheet for torch down roofing may be secured to the overlay board by either direct heat fusing, hot mopping or with adhesive. Cap sheet: The top membrane sheet to a torch down roofing system is a smooth cap sheet. As it is rolled out, the roofing professional will use a torch to heat the bottom of the cap to the top of the base sheet. When the two layers are pressed together, they form a seal. In a two-layer torch down roof, the system is complete at this point. If not, a third layer with granules is applied in the same way. Flashing for penetrations: A self-adhering modified bitumen membrane typically is used as flashing around features that penetrate the roof, like vents or HVAC (heating and air conditioning) units. Above that, metal flashing is used. The metal is primed before the base sheet is affixed to help it adhere. Building owners may find themselves choosing between a torch down and hot mopped roof, also called Built Up Roofing (BUR). What’s the difference? A hot mopped roof gets its name from its method of installation. After placing down base and felt layers, the roofing professionals pour liquid asphalt onto the roof and use a mop to spread it out. The asphalt then seals, creating a thick, waterproof and durable rooftop. Both types of roofing systems have similar lifespans, though hot mopped systems are slightly less puncture and UV ray resistant. Usually, hot mopped is less expensive to install than torch down. However, roofing professionals installing a hot mop system may be exposed to fumes longer and need to take precautions to protect themselves. There are many advantages to torch down roofing. The first job of any roof system is to keep water out of the building/structure, and torch down roofing has excellent water-resistant properties. Provided the membrane and insulation are installed according to manufacturer application instructions, the flat surface of a torch down roof prevents water from collecting and allows it to drain off. Torch down roll roofing is designed for all climates, expanding under heat and contracting under cold conditions without melting or cracking as other materials might. It’s this ability that gives torch down roofs their long lifespan. Climates with frequent snow are a challenge for flat roofs because snow stays on the roof until it melts. Water-resistant torch down roofing is an excellent choice in snowy environments. The cap sheet on a torch down roofing system has other excellent properties, including resistance to UV rays, and reflectivity to keep the building cool and energy efficient. If a torch down roofing system needs repair, it’s a relatively simple process. Patches of modified bitumen membrane may be added to the rip, gap, or broken seam. As with the installation process, a torch is used for repair. The main reason roofing professionals have preferred alternatives to torch down roofing is the danger and difficulty of properly installing these systems. A roofing torch requires the use of a gas torch with an open flame operating at extremely high temperatures and runs the risk of fire and burning the roofing professional. Safety training has reduced the occurrence of these accidents significantly. If you are investing in a torch down roof, you should ensure your roofing professional receives Certified Roofing Torch Applicator (CERTA) program safety training, available through the National Roofing Contractors Association (NRCA). Although you can purchase a torch down membrane system for a relatively low cost, a roofing professional may charge more to install this roof system because of the extra training, insurance and equipment costs involved. Further, the membranes are limited to a maximum width of one meter, which creates multiple seams for the roofing professional to fasten together. However, this width also has an advantage, as these rolls are easy to transport to restricted sites where bulkier systems cannot be used. Another disadvantage of torch down roofing is that seam failure and other installation errors can happen. If the layers of the torch down roofing system are not adequately sealed, leaks are possible. A three-layer system is less likely to suffer from these issues, and if problems occur, repair is simple. It’s also possible for water to get trapped between the two layers of roofing during application or repair. Therefore, it is strongly recommended that torch down roofing systems are installed in dry conditions. Which Roof Situations are Ideal for Torch Down Roofing? A torch down roofing system is best for slightly pitched roofs, between ¼: 12 to 1: 12 pitch, where your goals are to have a durable and long-lasting roof that stands up well to the elements, especially snow. If the roof is completely flat, torch-on roofing is not typically recommended. IKO is dedicated to education about all things roofing. Learn about other types of roofs for commercial buildings, or find a qualified contractor in your area.